Food bloggers and good friends Sara Wells and Kate Jones not only have a successful blog; they also recently won a national competition and published a cookbook. With more than a million monthly visitors to their blog, Our Best Bites, it’s easy to see that Sara Smith Wells (BS ’03) and Kate Randle Jones (BA ’04) are more than good home cooks. Better Homes and Gardens noticed their blog as well and invited Jones and Wells to participate in a national competition along with multiple other bloggers. They were required to adapt a recipe from The New Better Homes and Garden Cookbook and make it their own. 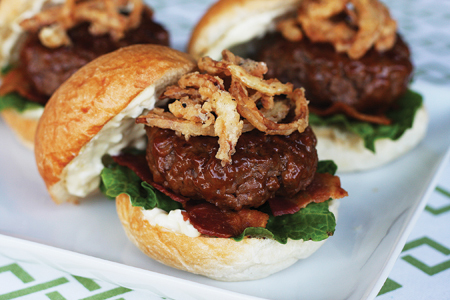 For their first-place winner, BBQ Bacon Sliders with Blue Cheese and Crispy Onions, they received a cash award, cookware, and products and gift cards to give away on their blog. Plus, their winning cook-off recipe appeared in Better Homes and Gardens magazine this spring. Wells lives in Idaho and Jones in Louisiana. Although mutual friends knew both of them (Wells had dated the brother of Jones’ husband), they had never met. 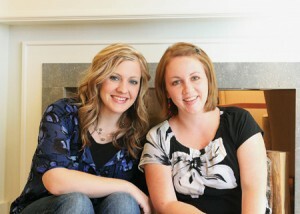 They became acquainted on a Mormon message board, and eventually Jones figured out she was responding to Wells. A face-to-face friendship ensued. “Cooking was something I naturally grasped onto growing up,” Wells says. “I’m a creative person, and I think cooking is a great outlet for that.” She took the artistic eye she used to earn a degree in landscape architecture and became a photographer, and she now styles and photographs many of their recipes for the blog. Jones, who has an English degree, says the blog gives her an outlet for her lifelong love of writing. She taught herself how to cook after she got married because, as she says, “we were so broke.” Once in the kitchen, she began to experiment and discovered she really enjoyed it. “My experience working at Kneaders restaurant and the Cougareat at BYU also helped,” she says. The success of their blog and the competition has led to a cookbook published by Shadow Mountain called Our Best Bites: Mormon Moms in the Kitchen. It features more than 100 of their favorite blog recipes as well as more than 40 new recipes, each photographed by Wells. Like their blog, the book contains tips and tutorials on topics as varied as making pita chips, roasting red peppers and garlic, making a pie in a jar, and cutting mangos and watermelon. Heat a grilling pan on the stove or an outdoor grill to medium-high heat. Combine beef, two tablespoons barbecue sauce, salt, and pepper. Divide and shape mixture into 8 to 10, ¾-inch thick patties (keep the size of your buns in mind as well as the fact that the burgers will shrink quite a bit while cooking). Grill for two to three minutes and then flip. Brush the top side of each burger with remaining sauce. Continue grilling for another two minutes. Flip burgers again, brushing the other side with more sauce. Continue to cook and baste the burgers until the internal temperature of the burgers reaches 160–165 degrees. Combine mayonnaise, salt, pepper, red wine vinegar, and garlic. Mix well, and stir in crumbled blue cheese. Store in refrigerator until ready to use. Heat two inches of oil to 350 degrees. Make sure to use a pot with sides (as opposed to a skillet-style pan) so the oil doesn’t boil over when you add the onions. In a small bowl, beat the egg and milk together. In a separate bowl, mix the flour, salt, black pepper, and garlic powder. Working with a handful of onions at a time, dip the onions in the egg mixture and let the excess drip off. Then dredge them in the flour mixture and lightly toss to coat. Place onions in hot oil and cook until golden brown. Remove and place on folded paper towels. Repeat process until all onions are fried. Lightly spread the bottom half of each bun with Garlicky Blue Cheese Spread and top with a lettuce leaf. Break each bacon piece in half, and place on top of lettuce. Put burger on top and drizzle with additional barbecue sauce if desired. Top with a small handful of Crispy Shoestring Onions. Spread remaining Garlicky Blue Cheese Spread on top halves of buns.